For dinner the fiance and I decided to go to Sultan's Grill, a small neighborhood restaurant located in Summerlin. Upon entering, I heard a customer talking to one of the workers saying how much he loved the food and that he'd come back for sure the next evening for dinner again. That was a good sign! Then as I was reading the back of the menu, there were rules that this restaurant adhered to such as they don't cook your meal until you order it. I was sold! The food was good as I expected it to be. 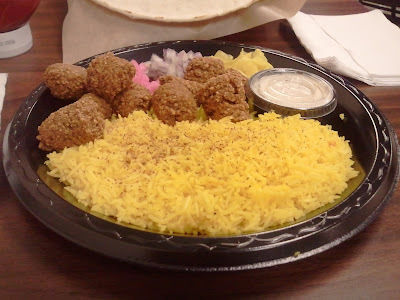 What I liked about it is that it's spices weren't overpowering like some Mediterranean/Middle Eastern food I've had. In my opinion, the rice was made perfect the evening we went there. I'd come back for the rice everyday if I lived closer to that area! Falafel Combo- A treat for the the vegetarian! Ground chick peas, ground parsley, ground onions and herbs, mixed and fried to a golden brown. Served with tahini sauce (sesame seed oil). Combos come with a salad, diced tomatoes, onions, torshi (pickled cabbage & pickled turnips), pita bread, and a choice of rice or fries.